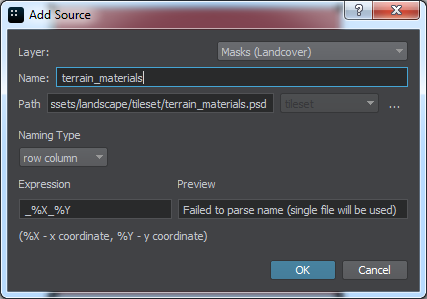 The Landscape Tool allows creating a terrain based on ordinary raster images (with no geodata). Follow the steps described in the chapters below to generate the terrain. If you use the Sim version of UNIGINE SDK, and you need to create a terrain based on raster images only (with no geo referencing), set the Mode to Flat and follow the instructions given below. Create a terrain based on the real geodata sources. Create a terrain based on both the ordinary images and geodata sources. Height (Elevation) (optional) - this type of data is used to generate terrain geometry. Here the height maps of the R8, R16 or R32f format should be loaded. The indexed black-and-white data sources are interpreted as RGB images, so they cannot be used for the elevation data sources. Albedo (Imagery) - this type of data is used to generate textures for the terrain surface. Here the albedo textures of the RGB8/16/32f and RGBA8/16/32f formats should be loaded. Alpha-channel in the second case is used to mark "no data" areas. 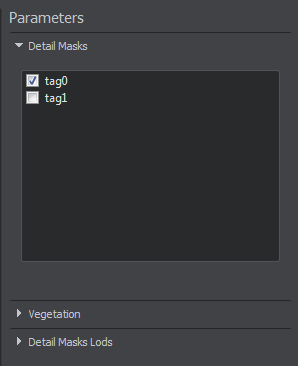 Masks (Landcover) (optional) - this type of data is used to generate natural features of the landscape (details, grass, trees, etc.). Here the detail masks the R8/16/32f or RGB8/16/32f formats should be loaded. If required, the data sources for procedural refinement can also be loaded (the Procedural data source that is used for procedural refinement). The albedo, height, masks or procedural layer of the data source. The path to the data source file(s). 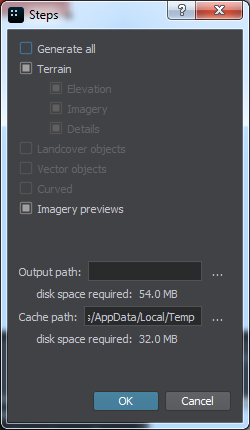 The data source can be represented as a single raster image or as a source tileset (a set of raster images). 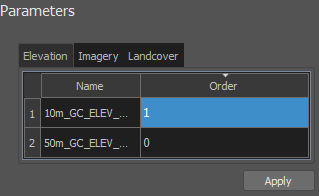 In the second case, the first file of the source tileset should be specified: the other files will be detected in the same folder automatically according to the Naming Type and Expression values. The following formats are supported: .png, .tif, .jpg, .psd, .dds, .tga. To specify the path, click the ... button. The source tileset isn't related to the tileset used for the generated terrain. You won't be able to load such files as data sources as the engine file system will use the generated runtimes instead. For example, if you specify a .png file, the file system will load the generated .dds runtime file that doesn't supported. row column - the row-column based tileset. When set, each tile of the source tileset is determined by the row and column numbers. index number - the index-based tileset. When set, each tile of the source tileset is determined by the index. The number of columns of the source tileset is specified in the Number of columns field. Row-columns or indices are determined automatically according to names of the files loaded for the source tileset. Each tile corresponds to a raster image file. The name of such file should contain info on the row and column or the index, otherwise, such file won't be included into the source tileset. For the row column layout, the default _%X_%Y expression is used: %X determines the row, and %Y determines the column. For the index number layout, the default _%X expression is used: %X determines the index. You can specify any desired expression, however, it should be able to determine indices of tiles by their file names. Shows the index (or the row and column) of the first file and the total number of the files added to the source tileset. 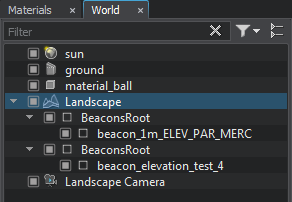 The files of the source tileset (except the first one specified in the Path field) will be automatically detected and loaded according to the values described above. Specify the Tile_0-0.png as the first file of the source tileset. Choose the row column layout. 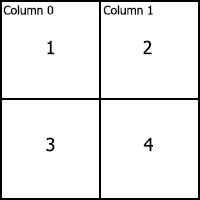 In the result, the following string will be displayed in the Preview field: First file: row 0 column 0, num files found: 4. 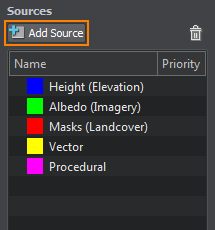 When you add the imagery, elevation, landcover or procedural data sources to the Landscape tool, their areas will be highlighted on the Preview panel with corresponding colors: blue for elevation, green for imagery, red for landcover and magenta for procedural. Area size of procedural sources is adjustable. The minus sign button deletes selected data source. 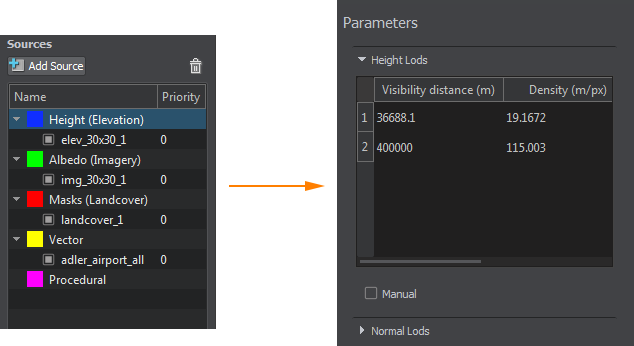 When you select the loaded data source, you can see its parameters in the Parameters panel. To change the loading priority of the rows and columns in the source tileset, click .... By default, columns (vertical order) are loaded first. 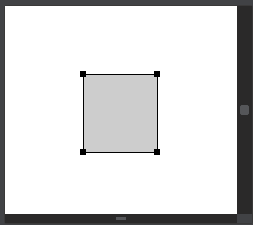 To change loading direction of rows/columns, change values of the vertical order and the horizontal order options. Largest size (km) is the size of the largest side of the data source in kilometres. 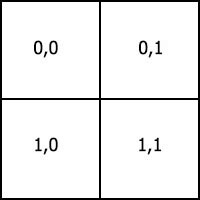 This value indicates how many kilometres correspond to the resolution of the largest side of the source tileset. Density is the density of the current data source in meters/pixel. This value indicates how many meters correspond to one pixel of the largest side of the source tileset. 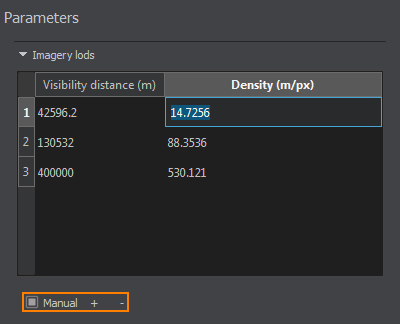 By default, the values are set automatically according to the size of the loaded files. Specifies coordinates of the source tileset. In case of float elevation data, you can change the Elevation scale value, by which the heights (float values) will be multiplied during terrain generation. Max Elevation sets the value (in kilometres) that should be used as the maximum height of the terrain. Min Elevation sets the value (in kilometres) that should be used as the minimum height of the terrain. Landcover data source parameters are described here. This type of data source is optional and should be added when generation of terrain details or vegetation is needed. Procedural data source parameters are described here. This type of data source is optional and should be added when it is necessary to refine data from elevation, landcover or other procedural data sources. You can specify processing order for all data sources except vector ones. This can be done either using the Processing order field of the data source, or via Processing Priority in the Settings panel. 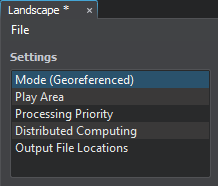 To generate the terrain based on the raster images with no geodata, the Flat mode should be set. In this mode, no reprojection is performed for the loaded data sources. Play Area represents a gray outlined rectangular area in the Preview panel. The central point coordinates of the Play Area. The size of the Play Area: width x height. The size should coincide the Largest size values set for the data sources. If the Play Area too large, the generated terrain may be outlined with the grey area. On the Parameters panel select a tab, corresponding to a group of data sources, for which the processing order is to be changed. For each item in the list of data sources displayed click a cell in the Order column and set the desired processing priority value. A data source having the priority value of 2 will be processed before the one that has the priority value of 3. After setting new processing priorities for data sources click Apply. A coarse 100 m/px elevation data source Elev1. A procedural data source Proc1 with the density of 10 m/px which refines the data from Elev1. A procedural data source Proc2 with the same density of 10 m/px which operates with the data refined by Proc1. So, the expected data flow diagram would be: Elev1 -> Proc1 -> Proc2. But generally, as both procedural data sources have the same density, default prioritization may result in the following data flow diagram: Elev1 -> Proc2 -> Proc1. Which definitely is not the same. This situation can be avoided by setting the priority of the Proc1 source equal to 2 (as the default priority value for Houdini assets is 1). Now you can generate the terrain by clicking the Generate button. In the Steps window, that appears, you can select what is to be generated. The flag indicating if imagery previews are to be generated and placed at the corresponding location on the area displayed on the Preview panel. The coordinate system for generated terrain is Cartesian ENU (east-north-up) with the origin taken from the play area center in Landscape tool.